This year has been fun, and we’re a little sorry to see it go so soon. We’re very glad that you have been a part of it! To thank you for being a member of our little sewing family, we made you each a little gift. 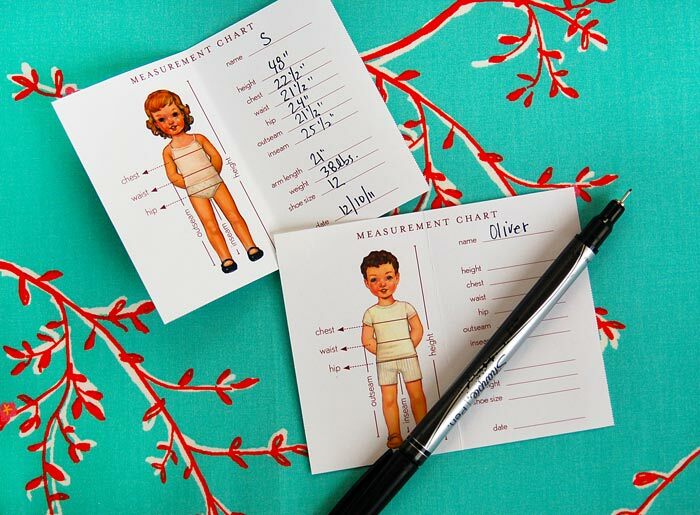 We know how helpful it can be to have the measurements of your little one handy, so we’ve made up a wallet-sized measurement chart that you can print out, trim down, and fold up. When folded in half, it’s the same size as a credit card, so it will fit neatly in your wallet and will be handy the next time you’re shopping and can’t recall the shoe size for your 2-year-old. Or when you’re shopping for tights and need to know the height and weight of a certain 6-year-old. I’m planning to complete one for S (those aren’t her real measurement in the photo, but it will be fun to see how close I came when I estimated!) and save each one when I replace it with a new one as she grows. I think it will be fun for us to look back at the charts as she gets older, and maybe she’ll be curious about how her growth and development when she has children of her own. You can download your own measurement chart from our website. Happy holidays! perfect! i needed that! thank you! That is a nice idea! What a sweet keepsake. Thanks and Merry Christmas! How thoughtful and perfectly handy! Thank you! Thanks! I usually have a giant chart with measurements for my seven nieces and nephews (they all now know to line up to be measured at family gatherings) but this is much cuter! Oh my, these are fabulous! And just what I needed! Thank you for the lovely gift. This is such a nice idea! Thank you! This is brilliant, one of those simple ideas that makes so much sense and is so obvious once somebody else has thought of it! This is fabulous! I love it. Thank you so very much! These are terrific! I’m constantly bugging my daughters for the kids measurements. Immediately sent this to the local copy shop to have them print me one on cardstock – I could not wait… THANK YOU! Brilliant idea, Liesl! Excllent idea! I can never remember my own measurements so this will be very helpful! Brilliant idea Liesl! Thanks so much they are just too adorable NOT to have. Oh, thank you!! These are wonderful and adorable! mwah!! Unbelievably adorable! What a great idea. My mother has also been hounding me for these measurements, so she’ll be thrilled as well. It has been some time since sewing clothing for me or anyone else, for that matter. Maybe, I will give it a try. Some of your patterns and ideas are right up my alley. Thanks for this opportunity. Thank you, I have been writing my granddaughter’s measurements down on little pieces of paper every month. These are so cute I know she will love to look at the card while I measure her then I will save them for her. So cute. Really glad I found this today. I want to shop for my grandson soon and I’d like to have my daughter give me his measurements. I may also print this out annually and save with my Christmas decorations to see my boy grow!! Just what I need! Thank you, and happy holidays! So sweet of you to share this with us! Thank you so much:) Off to go print . . .
A wonderful wee giftie indeed. Thanks so much. Ow would love to have these but download doesn’t work on my computer, very strange…. This is great! My grandkids are a 100 miles from me and this will help a lot when i go see them to up date their measurement and i can leave one for my daughter so she will know what mesaurements i need. I absolutely love this! I keep taking my kids measurements and writing them down on random pieces of paper and then losing them and then doing it again. This COULD NOT BE CUTER and practical. this is far too perfect. thanks for sharing. can’t wait to download and fill out and keep in my wallet. AGAIN……. THANK YOU!!!!!! I love this! It’s very cute! I went to print some, but hate to waste paper/cardstock with there only being one card (actually 2, but I have 2 girls) per sheet. It would be super fantastic to have one for boys and one for girls with 4 per sheet so you could print and have 4 at a time for the required/preferred gender and not have to waste any paper. Thank you for this and hopefully a modification will come out. I’m not savvy with adobe or I would try to make one for myself. I’m going to go check out the rest of your website. 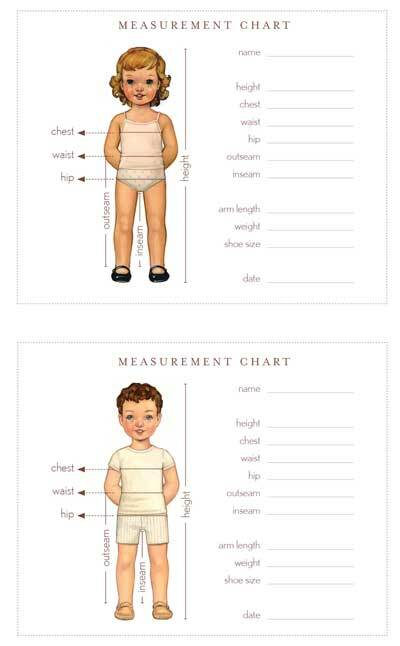 This is so helpful for creating a particular size for a child – Thank you Dear! Thank you! These beautiful cards are truly a gift.